The Walking Dead has done it again... They left us with a handful of unanswered questions. But, this time it's a little different. In the winter finale, we saw good and bad things happen. Daryl made it home, but two Alexandrians lost their life. Rick and Maggie were reunited but Aaron was almost best to death. The yin and yang effect. But there are still multiple unresolved questions fans are demanding to know. I am here to give my personal opinions and predictions towards said questions. Hope you enjoy. Question 1: Who do the mysterious boots belong to? The boots, the boots, the boots. This seems to be the biggest burning question of the winter break teaser. After the credits ended, there was a small clip. We saw Father Gabriel being watched through binoculars then these pair of boots were seen jumping from a tree and walking away from Alexandria. Many people believe these boots are from a new group called "The Garbage Pail Kids." Others have thought the boots may belong to Sydney, the Oceanside member that saved Tara back in Episode six, "Swear." Others have speculated that the boots belong to one of the Morales family members from season 1, which is a little far fetched BUT not completely out of the picture. 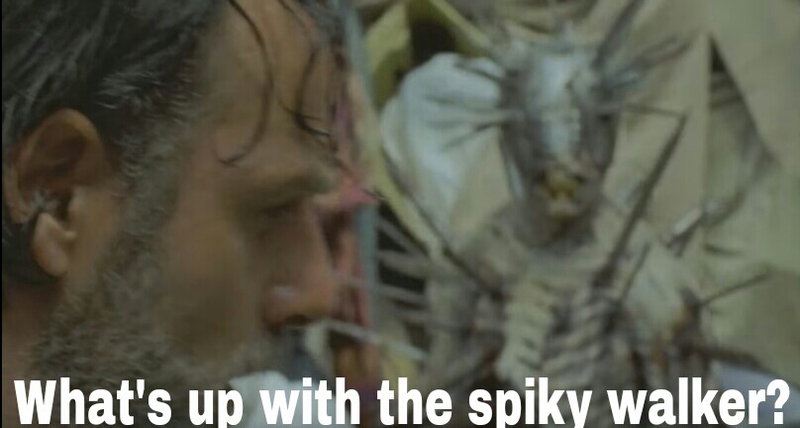 Question 2: What's up with the spiky walker? Ah yes, the spiky walker. This walker was a quick feature at the end of the thirty four second trailer promo. Personally, I think this walker is attached to the new group coming, "The Garbage Pail Kids." Maybe they'll use it for protection, maybe its just a walker that was in an explosion. Who knows... we will in 7b! 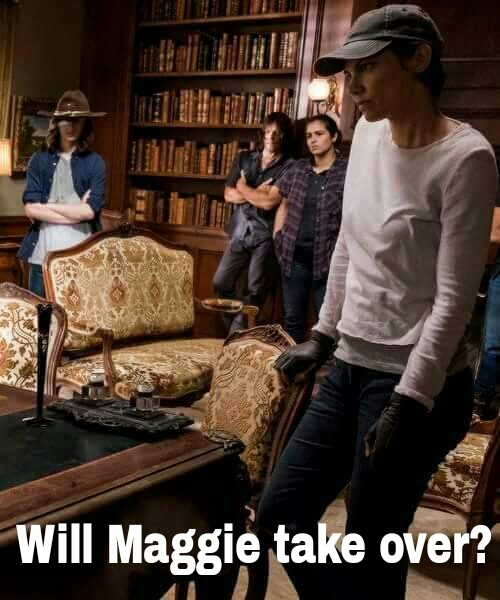 Question 3: Will Maggie take over? This question seems to be a popular food for thought. We all know The Hilltop's leader, Gregory isn't fit for leadership anymore. Who would be better than Maggie? Maggie is a born leader, Dianna knew it, Rick knows it. Who better to take over than her? She's a power house and a badass but how would they dethrone Gregory? Simple. It may go something like this: Rick will find out how much of an "unwelcome recipient of the protection" Gregory has been and force him to step down or turn him over to Negan and The Saviors for hiding product. Maggie would dominate as the leader of The Hilltop. Everyone loves her, she's fair and deserving and would fit in as leader just as good as Rick or Ezekiel. Question 4: Who rescued Daryl? This is kind of a hard yet easy topic given a few small details placed strategically throughout the few episodes that pertain to Daryl. This season, Daryl was featured in three major episodes and two episodes where he was "sprinkled" through. The season 7 premiere, The Cell and Heart's Still Beating were the episodes he was featured most in and the other two were Swear and Sing Me A Song." In season six episode 6, "Always Accountable," Daryl ran into Dwight and Sherry for the first time. Dwight originally thought that Daryl was one of Negan's saviors but was actually wrong. Now that Dwight (did have) control of Daryl, they share a mutual understanding of the badass-ery code. Dwight very likely could have slipped Daryl the key in feeling like he'd gone too far. Because of what his friend said (before he shot him) he could have realized that its actually true and he could be coming to his senses. Ever since Sherry saw that Daryl was at the Sanctuary, she showed interest, sincere sadness and she had an apparent agenda; to apologize and repay Daryl Dixon. Considering her status in the Sanctuary, she could have easily slipped into Dwight's room, grabbed the key, written the note and slipped it to him. My third and final prediction is the possibility of Negan setting Daryl up. In episode three, "The Cell," Negan had done something similar to Daryl by having Fat Joey leave his cell door unlocked. When confronted, Negan told Daryl that "this was Daryl's chance to show him (Negan) who he was and to probe his loyalty." So why not maybe assume it could be a set up by Negan? It's possible in my opinion. Maybe the Saviors know that Daryl escaped only because of Joey's death or maybe they know he's missing because it was a plan against Rick and Co. 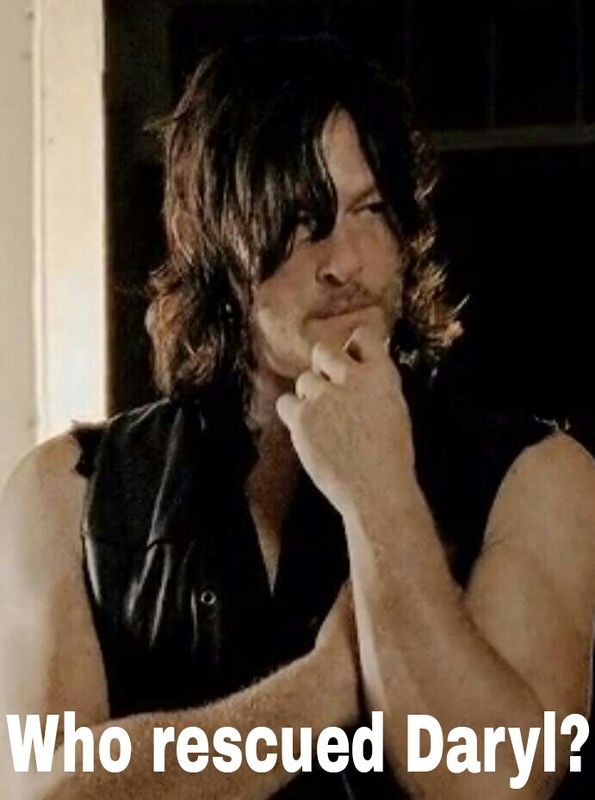 Question 5: What's to play out for Daryl? There are multiple scenarios as to what could happen and play out for Daryl. Daryl could be at the center of the war against the saviors or the silent killer that sneaks up from behind and kills them all. At one point, Daryl wanted to obtain explosives and blow them all up. Oh wait, he did blow up about 13 of Negan's men. Well maybe he'll do it again. Daryl Dixon is a dangerous character. That's obvious. And the demons he suffers from are going to benefit him for once. Dixon will become a vengeful, enraged beast that will kill everything that isn't his family. Daryl may kill Dwight. He knows he's Negan's man. If he does come to Rick and Co for a chance to explain and try to bargain to help aid against Negan, Daryl may beat Dwight halfway if not completely to death. After the torture (We're on Easy Street) and the endless dog food sandwiches, he's going to get his revenge some way. And I have a feeling its going to be a sickeningly sweet one, too. Question 6: Will Eugene survive and what's going to happen to him? As the winter finale left off, Eugene was taken into the custody of The Saviors. Eugene is a valuable asset to have. He's intelligent, knows things and can be very useful. He made the bullet that marred Lucille. He knows other things too, some yet to be known to fans. But I'm sure Negan will have it out of him within the first hour of imprisonment. 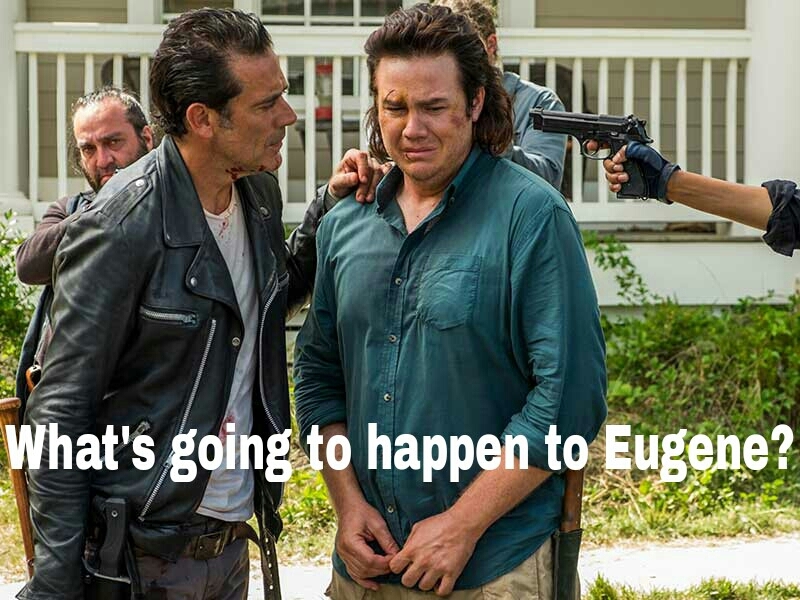 Eugene will survive, at least a few episodes in. Negan knows that Eugene is a more valuable asset than even Daryl was. He can extract information from him, he can have him make bullets for the armory weapons and teach others how to make them to maximize the bullet manufacturing process. Someone (maybe Jesus) may come back to the Sanctuary and rescue Eugene like he did Daryl. He knows the layout so it'll be easier this time around. But, Eugene may die in the escape. The Saviors can't afford to allow anyone else to break out. 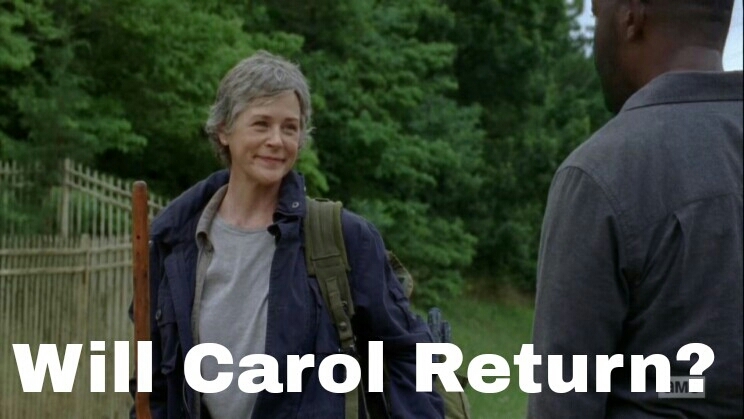 Question 7: Will Carol return? Over the last few episodes of the sixth season, Carol became weak, almost channeling her season 1 role (meek and weak). She had become a dynamic character that people looked up to and was an all around badass. But ever since Sam's death (Jesse's son) she deteriorated down to her old weak self. Many don't think Carol has what it takes anymore. Maybe she still does. I think that Carol will fire back when the news hits her about Glenn and Abraham. Robert will more than likely come to her upon the arrival of Rick and the others. She'll snap out of her rut and join the war against Negan. Carol will become Carol again and they may have her to be the unassuming killer that will take Negan down herself. Carol is just as dangerous as the others. She'll kill on the spot without a second thought. Carol has the mentality to come back but needs some serious rethinking of her decisions. She can come back but its a decision of will she or won't she. Question 8: What happened to Heath? The last time we saw Heath, he'd just escaped as Tara fell over the bridge in episode 6 "Swear." He'd disappeared and had taken the RV but left a key card that said "PPP." What does that mean? No one knows as of yet. Heath actor, Corey Hawkins had other projects going on at the time of filming. That's why the filming was left open ended for his role. Heath is a major role in The Walking Dead comic books so some would say he's safe. Others would not. In my opinion, I do believe that we will see Heath alive and well again. I think that he may have thought Tara was a goner for good and saw no reason to wait for her return. I think he had a rehash of what Michonne said to him in season 6. "Rick said what he said because sometimes you don't have a choice. You haven't been through it. Not like Rick. Have you ever killed people because they were coming for you friends? Have you ever done things that made you afraid of yourself afterwards? Have you ever been covered in so much blood that you don't know if it's yours or walkers or your friends? Then you don't know." 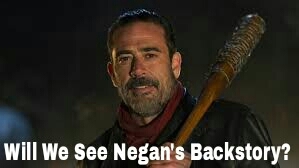 Question 9: Will we see Negan's back story? The notorious villain Negan has reigned King since the start of the seventh season. He bashed in two of our favorite characters skulls and demanded half of the Alexandrians supplies. Hesitantly they gave it up. But what came after that was more horror. Up to this point, we don't know anything of the crazy man's past (on the show). Yes, I do believe there will be a Negan character-building episode. In the comics, we saw how Negan came to be. Just like a lot of the essential characters, we saw how they came about. But I think his back story may be a little different from the comics. Question 10. Who will have the major seventh season death? The final question of the article... Who's going to die? We all know that The Walking Dead generally has a big death in the mid-season finale (Dianna in season 6, Beth in season 5, Hershel in season 4, Lori in season 3 and walker Sophia in season 2). Considering Spencer and Olivia died, it was easier on the fans considering the horror of the seventh season premiere with Abe and Glenn's death. So, the question still stands: who will have the major character death of the season? Sonequa Martin-Green was casted in the new show Star Trek; Discovery. Filming both shows will be a daunting task unless she films S.T on the off season. She also hasn't had a role in the comic books so that fact alone is against her. She is a very popular character in the show and seeming how she can't be happy in the show for more than what seems like a few episodes, why not remove the consistent black cloud lingering above. Another fact pointing to her possible demise is the fact that she's on a suicide mission to kill Negan. She wants to do it alone and knows that it's a long shot but believes she can to it. Since the Sam was attacked and killed by a horde of walkers in the mid-season premiere of season 6, Carol changed. She because more like her season 1 role of weak and frail. She's afraid to kill because she can't stand to see people hurt anymore. That alone has almost gotten her killed more than three times. I think her death is a strong possibility considering she's taken on a weak role, hasn't had a huge role in the series since the beginning of season 6 and once again, her role has been all TV time considering she died in the comics a while back. Morgan is a possibility for the plain and simple fact that he is also a dead character in the comic book. His role is simply screen time and nothing more. Morgan is a popular character but not to the point to where its too serious for his death to cause a huge impact like the season 7 premiere. He is on my list for the major death of the season. Carl is the third longest running character since Atlanta next to Rick, Carol and Daryl. He's still alive in the comics, yes. And he's become a major character throughout the seasons. Carl actor Chandler Riggs was recently accepted into college. College is a big responsibility. So is the show. He would have a lot on his plate going to college, filming the show (sometimes from 4a.m. to 9p.m.) and being a young man. He has his personal life to contend with also. Carl has been a major character since I'd say the prison (season 3). It would be another way for the film director and casting people to bring in more characters for the new seasons forthcoming. Carl is a possibility but not big enough for me to give a definite yay or nay. As we all know well enough, The Walking Dead is a tricky show to get a definite read on. Anything truly could happen. So we'll just have to ride out these final days until the show comes back on. Luckily it's approaching fast. Are you ready for the mayhem? The back half of the seventh season begins February 12th at 9p.m. only on AMC.